This project provides a fantastic opportunity for young composers aged 14 – 19 to compose a piece of music inspired by one of the most memorable images of WW1. Compositions should be between 3 – 6 minutes long and be created in a jazz idiom for any combination of instruments, up to a maximum of 6. Do you remember 'Blood Swept Lands and Seas of Red ' the installation of ceramic poppies at the Tower of London in 2014. It was inspired by the first line of a poem by an unknown WW1 soldier and was viewed by over 50,000 people. This competition invites you is to respond musically not to a poem but to a painting. 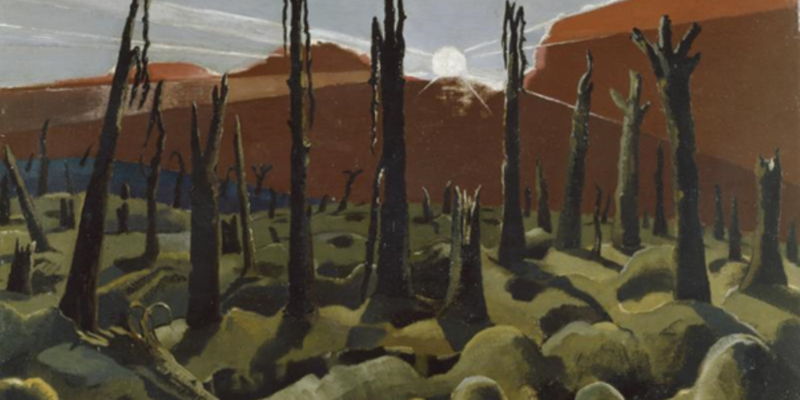 'We are Making a New World' (Imperial War Museum ART 1146) is one of the most memorable images of WW1 - it was painted from sketches made at the front by a young and newly married war artist called Paul Nash. You are invited to create a piece of jazz music inspired by this painting &/ the words from the letter to his wife, which could be used as a narrative or vocal line to add drama to your work. You can use any combination of instruments but please be aware that a public performance can only be given if an appropriate ensemble of players is available. Compositions should be between 3 – 6 minutes long. 16 November 1917 Nash writes an impassioned letter to his wife which explains his motivation for the painting……..
'I have seen the most frightful nightmare of a country more by Dante or Poe than by nature, unspeakable, utterly indescribable. In the fifteen drawings I have made I may give you some vague ideas of the horror, but only being in it can ever make you sensible of its dreadful nature and what our men in France have to face. We all have a vague notion of the terrors of battle....but no pen or drawing can convey this country- the normal settings of the battles taking place day and night, month after month. Evil and the incarnate fiend alone can be master of this war, and no glimmer of God's hand is seen anywhere. Sunset and sunrise are blasphemous, they are mockeries to man, only the black rain out of the bruised and swollen clouds all through the bitter black of night is fit atmosphere in such a land. The rain drives on, the stinking mud becomes more evilly yellow, the shell holes fill up with green-white water, the roads and tracks are covered in inches of slime, the black dying trees ooze and sweat and the shells never cease. They alone plunge overhead, tearing away the rotten tree stumps, breaking the plank roads, striking down horses and mules, annihilating, maiming, maddening, they plunge into the grave which is this land; one huge grave and cast up on it the poor dead. It is unspeakable, godless, hopeless.